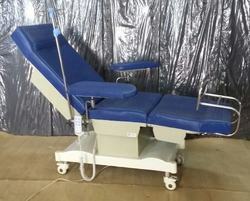 Widely used in a number of hospitals and blood banks, the offered Donor Chair enjoys a high demand in the market. The offered range of chairs provides maximum comfort to the one using it. Priced at the best rate possible, the range is widely patronized by the customers. With the aid of our ultramodern manufacturing unit and a team of dedicated employees, we manufacture, supply and export finest quality Donor Chair. These chairs are used by different individuals while donating blood. The offered chairs are designed to ensure that blood cannot flow back while the donation process is on. Looking for Donor Chair ?